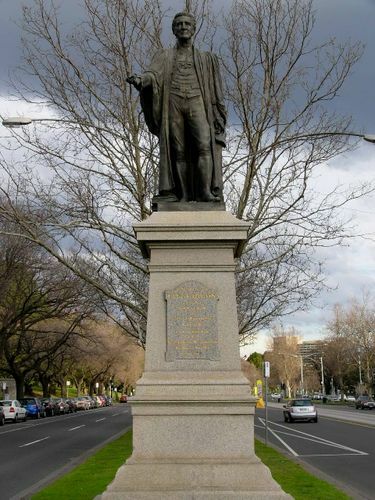 A statue commemorates Edmund FitzGibbon (1825 -1905), the first town clerk of Melbourne from 1856 to 1891, who was a champion for the preservation of parks. The statue is a 9 foot high bronze of him in barrister`s gown and whig and knee breeches. His right hand extends towards the city and his left rests on a pedestal holding a scroll. At the base lies a pile of books, mounted on a pedestal of Harcourt granite. Appointed Town Clerk in 1856, FitzGibbon helped to obtain crown land for public markets, and fiercely opposed attempts to alienate parkland. He prevented the Melbourne Gas Co. from selling its grant of crown land at West Melbourne, and survived an attempt by leading gas shareholders to unseat him as town clerk. In 1891 Fitz Gibbon became full-time chairman of the Melbourne and Metropolitan Board of Works until his death in 1905. A large number of citizens assembled in St. Kilda road, near the southern extremity of Prince's bridge, on Thursday afternoon, to witness the unveiling by the Lord Mayor of Melbourne of the statue to the memory of the late Mr. E. G. FitzGibbon. Many past and present members of the City Council and the Metropolitan Board of Works, and officers and servants of those bodies, were present. In the course of his remarks, the Lord Mayor said the city for all time would be indebted to Mr. FitzGibbon. At all times he fought for the preservation of the park lands. (Cheers.) A Voice.—We want a man like him now. (Hear, hear.) The Lord Mayor.—Up to the day of his death Mr. FitzGibbon never backed down an inch in that matter. The splendid tramway service of the city was another evidence of his great work. As a friend he was staunch and true, and those who knew him most loved him best. (Applause.) The statue, when unveiled, evoked general commendation. The figure, 9ft. high, is in bronze, on a pedestal of Harcourt granite, 12ft. 6in. high, and the work is by Mr. James White, the sculptor, to whom the Queen's Memorial statue was also entrusted. The figure is dressed in knee breeches, with barrister's wig and gown. The right hand is extended towards the city, and the left, resting on the pedestal, holds a scroll. At the base of the statue lies a representation of a pile of books.-- The cost of the statue was £1,000. Australasian (Melbourne), 1 February 1908.